This post considers the latest news about methane migration in Pennsylvania. But to tell that story, I first have to tell another story. In 2010, the number of public relations specialists in the U.S. had risen to an all time high of 320,000. By contrast, the number of reporters had fallen to a low of 58,500. The fantastic trajectory of the PR business will hold strong at least through 2020 with a 21 percent growth curve, according to Statistics at the Department of Labor. Over the next decade, the number of new PR jobs alone will exceed the payroll of the entire news industry. For professional reporters and those who value their vocational contributions to society, it’s only going to get worse. The reporting payroll is projected to decline by another 6 percent by 2020. That means the public will be receiving more information billed as news that has been shaped, spun, or fabricated by professionals working within the narrow parameters of particular corporate interests. This growing rubric of the Fourth Estate will use the traditional tools – press releases and phone calls -- to leverage stories into news outlets. It also has at its disposal Facebook, Blogger, and Twitter – powerful tools to bypass the working press altogether. At the same time free content on the Internet has eroded the number of staff writers and newscasters and lent traction to corporate interests, it has given rise to a volunteer corps of citizen journalists, muckrakers, and filmmakers. Josh Fox and Michael Moore have become role models for a new breed of advocacy journalists who, once merely consumers in the Market Place of Ideas, now have new access as vendors via social networks. By way of example, I have written about Vera Scroggins, an amateur videographer who lugs equipment over hill and dale, into town and country, recording municipal meetings, toxic spills, and interviews with residents. She filmed operations of shale gas operators that were beyond the wherewithal of the sparse professional reporting staff in rural northern Pennsylvania, and posted footage on the Internet, providing a repository of information otherwise unavailable. Participation of people like Vera is a good thing. It’s empowered the populous by giving everybody a voice -- access to the public stump in the square, and the ability to share information. But it comes with a cost. The indy and PR news sources that thrive on the Internet are a welcome boon to free speech, but they also tend to undermine the traditional free press, which is unable to generate on-line revenue sources needed to sustain professional reporting. Beyond that economic consideration, there is the matter of content: Independent news largely comes unfiltered for noise, bias, and confusion. When newspaper reporters get a fact wrong, large or small, they are called on it. If necessary, corrections are issued, and their frequency is considered in a reporter’s annual performance evaluation. Additionally, reporters’ work has to pass muster with a staff of editors. These editors undoubtedly have varying political views, but they are all professionally committed to serving the expectations of a diverse readership. Editorial staff is separate from the news staff, both in the physical segregation of office space and in clearly defined roles. As the public turns to free content on the Internet at the expense of paid content by professional reporters, the type of credibility and checks and balances that professional journalists have traditionally brought to the public are disappearing. The depth of reporting, and the newspaper’s traditional role as advocate for open government and transparency in matters of public interest are also suffering with the decline of revenue available for investigative journalism. It’s not just about the revenue, it’s about the source of revenue – from an independent readership and viewers – that makes the press such an effective watchdog. Now for the other part of this story. The gas industry claims that drilling is not a public health threat, and that fracking fluid is harmless. In support of these claims it cites lack of evidence tying operations to pollution and illness. What’s missing is full disclosure. The industry operates on private property without the level of regulatory oversight that other industries face. (It is exempt from both federal Safe Drinking Water Act and hazardous waste laws that require disclosure of what goes into and what comes out of the ground.) When something goes wrong, it is often a matter between the company and the homeowner to resolve. When legal pressure necessitates, the industry can make the problem go away with settlements that contain non-disclosure clauses. A recent example came to light with a personal injury claim against Range Resources and other operators by a family in Mt. Pleasant Township, Pa. Range Resources agreed to pay the Hallowich family $750,000 to settle a lawsuit for personal injury damages related to operations near their home. The case was settled by the parties in 2011, no official complaint was filed, and the records were sealed. We only know this because the Pittsburgh Post-Gazette and the Washington Observer-Reporter filed and won a suit to get the records unsealed. The unsealed documents also revealed that the PA Department of Environmental Protection did not maintain records of an investigation into a complaint about water contamination at a neighboring property, and that the investigator, Mark Kiel, soon left the agency to work for the gas drilling company he had been investigating. For every case that gets unsealed, there are hundreds, if not thousands of cases sealed in documents that are never opened because their public relevance goes unchallenged, and that’s largely because mainstream media outlets have fewer resources to do that then they did in the golden age of investigative journalism. Meanwhile, both the DEP and gas companies are able to keep matters of public interest unfolding in Susquehanna County from full public view. Last week, the DEP issued a brief statement that exonerated gas company WPX of causing methane pollution in three wells in the Township of Franklin Forks. Yet the agency is not releasing any results related to the investigation or to its conclusions. It is known that the Franklin Forks area and the nearby Salt Springs State Park contain rich methane reservoirs in both deep and shallow formations (hence the attractiveness of the area to petroleum operators). Although the DEP released its conclusions that the gas affecting the water wells was not from nearby gas wells or production zones being tapped by WPX, it did not explain the source or course of pollution at concentrations five times greater than the threshold for explosion risks. It’s been a high-visibility case dominated by interest groups. Yoko Ono and other celebrities supporting anti-fracking groups visited the site in January to press their case against allowing fracking in neighboring New York state. On the other side of the fence, the industry group Energy In Depth issued a press release titled “DEP Debunks Methane Claims in Franklin Township,” which seized on the conclusion of the DEP investigation as proof that the industry is being vilified. Meanwhile, the landowner of one of the affected wells – the Manning family – is suing WPX for the pollution. Given the trend, it would be unsurprising if this gets settled behind closed doors. Franklin Forks may have been less of a story if not for events that have unfolded in Dimock Township, about a dozen miles to the south. More than four years after the explosion of a residential water well called attention to the problem, the DEP is still investigating recurring water pollution problems in the middle of a gas field being developed by Cabot Oil & Gas. Wells providing water to several dozen homes have been taken off line or fitted with filtration equipment to remove gas and other pollution since the water well of Norma Fiorentino exploded on New Year’s Day, 2009. Under the Rendell administration, the DEP cited Cabot for various violations related to the problems. To be clear, the agency has a policy of releasing incomplete data to homeowners, a policy that has produced much criticism but little action. Officials justify the long-standing practice of excluding some fields as a sound method to filter noise from relevant data. Critics argue that the agency cherry picks the data, and the unreleased fields might be useful indicators of drilling contamination and other problems. Moreover, homeowners have a right to all results of water quality tests that can flag health risks. The fight over the cause and consequences of methane seeping into private water wells in Susquehanna County is one example of an issue that could stand a little more legal leverage from professional news outlets. While some outlets, including the Scranton Times-Tribune, do what they can with declining resources to report the story, readers would be well served by a legal challenge to the DEP’s refusal to release ground water analysis paid for by tax-payer money concerning matters of overwhelming public interest. News outlets, of course, have to choose their battles and they have less discretion than ever as their revenues fall. In the meantime, we do our best with half-page press releases issued by regulatory agencies, rhetoric from talking heads for or against fracking, or hyperbolic “I told you so” by PR firms and activists representing stakeholders. Outstanding Tom. So much to digest and so little capacity to digest it. Need more coffee. I may have to read again and comment multiple times. 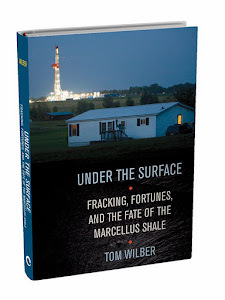 There's three huge topics intertwined into one post: 1) the state of journalism, 2) government (people's) agents not performing their function and 3) unfettered shale gas exploitation. Yet you somehow made it all make sense. Of course there's many more sub topics of importance. One critique. The upper management and deal makers on newspapers and media companies didn't help the situation by cannibalizing its own business. Sam Zell buying and destroying the Tribune and Conrad Black draining the Sun Times coffers in Chicago. This had nothing to do with journalists and readers (subscribers). This was pure extractive capitalism for the ideas age. Us readers or news junkies will pay, if the company wasn't at the same time cutting the quality of its product (less journalism), while paying off executives millions to go away. Among a litany of other deal-making and financial crap. Nobody wants to be a chump. That would be paying readers. Sort of what you said, but more blue. It's from Rolling Stone. Maybe it's true that you get what you pay for. Accurate information has always been an extremely valuable commodity, and in our highly complex and global society it is, if anything, even more important, particularly since more and more of our information seems to be in the form of PR pieces masquerading as news. So maybe the public should be willing to pay high enough subscription prices for their online and/or printed news to allow the media to function as reliable sources of detailed, carefully researched information. I guess it all comes down to priorities: does the public want to know what's going on, or does it just want to be entertained? If we stay in the dark, then we cannot have a functioning democracy--we cannot vote intelligently and responsibly if we don't have sufficient information. This applies not only to the fracking issue, but to all issues. I much appreciate the quality of content and style that you give to us, your readers. And would like to be able to quickly and easily make the occasional financial contribution to your work. Would you please add a PayPal "donate" button to your site. Preferably at the top of the sidebar. Thanks. Keep up the stellar reporting. Thanks for the suggestion for PayPal. I would be more inclined to go this route than negotiating the distracting complexities of advertising. The journalist in me is a little more experienced and adept than the business manager in me, so I have some more homework to do. I’m also working on another book proposal and will have to evaluate where SGR fits into the long-term picture. Regardless, I will have an online presence for some time to come, and it will necessarily have to evolve. A PayPal may work into a comprehensive plan to support my work. Will keep everybody posted. I am reeling from this blog. How do we get people to care? How do we compete with the dazzle of the promise of gold? Tom, keep on writing. Hopefully, there are a few Susquehanna County folks that can read. and I must add that Haliburton is a few feet down the road from me at a well site that is being "serviced" and my water today was just a tad bubbly...I think I can say that because this is a "new" development. Oh, did I call anyone? Now who would that be? GHOST BUSTERS? Why don't you set up advertising on this blog via adsense or whatever that widget is. You just have to add the widget to your blog - lets say on the right column and adds find you based on content, keywords, and page description. You probably know this already so if this is peanut gallery stuff, sorry. Establish what your intentions are as a journalists, the premise of the blog and stick with it. You don't have to look for advertisers - they look for you. If let's say the company Fracking R' Us (FRU) advertisements show up - it might be goofy to some readers - but hey the onus is on them to tell Google they don't want to appear on your blog. FRU can't control your content if you got nothing to lose. Unless you move into a Manhattan office and hire a staff after one ad shows up on a post. Then you're stuck. AdSense is a really bad idea. Besides potentially undermining Tom's credibility as an independent journalist, the income would be tiny. What's an independent journalist? Honest question. "On the Media" the NPR program had a really interesting discussion on the state of media today in the digital world. The program date is 5/12/13. Bottom line is that anyone who wants to get to investigate an issue and write about it, better become innovative to get paid. It's not like the profession of journalism is going down the toilet or anything (satire). Why would a journalist receiving money from a NGO or a prestigious non-profit, or several wealthy people, or a bunch of like minded regular folk be any more independent than someone who puts a widget for ads on their blog? The media is the message or something like that. Good question. An independent journalist, in my book, is one who is off the payroll of a news agency. You raise a good point about the source of funding and to what degree that may affect “independence” I can offer this very general thought. Because Internet readership depends on specific selection and searches, it lends itself (for better or worse) to special interest. When it comes to bee –keeping or crocheting or how to perfect a slide for little league, that’s pretty cool. When it comes to seeking out news that fits your world view, you start down the road of confirmation bias and the idea of eco chamber. Advertisers -- such as the local car dealer -- once dependent on newspapers now have the freedom to get more bang for their buck on line, as newspaper readership declines (with free content on line) and the utility of Internet improves. Car Dealers can now go directly to prospective buyers on their web sites, for example. It also becomes a question of how much advertisers reflect content versus influence content. Newspaper advertisers were never in a very strong position to influence content, nor did they have a strong motive to do this. (The breath and diversity of audience being just one of many reason) although their business would be mindful of demographic considerations as applied to a given advertising strategy. This model does not hold up well – in fact it’s completely breaks down -- with all the variables introduced with free content/ special interests/revenue sources etc. of Internet. Thanks Tom. So independent journalist are independent contractors (or freelancers)?. Or 1099 v. W-2. If your blog posts are part of sales and marketing (like free samples), then maybe its best not to advertise to avoid raising suspicion or posing conflict with clients. fwiw, I think you should allow advertisements. At least as an experiment. Just watch how you use the word drill. Geology terms can be taken two ways too. Tom: In the cases in which the PA DEP reported incomplete test results to homeowners, do you know if any of the homeowners filed Right To Know requests with the PA DEP, and if so, what the outcome was? There are several logical and reporting errors with this piece. First of all, you spend much time establishing how the internet and "advocacy" journalism are a boon to free speech but it comes at a cost - integrity through fact checking and editorial review. Then you go on to present your own advocacy position without identifying or verifying your sources. You use conjecture and hyperbole without citing the facts behind your arguments suggesting that you are an advocacy journalist. Are you and advocacy journalist? You state, "The gas industry claims that drilling is not a public health threat, and that fracking fluid is harmless." I have never seen a statement by the gas industry or an individual gas company where they state that fracking fluid is harmless. I have heard them make many statements intended to downplay the risk of fracking and fracking fluid but I have never heard them say it is harmless. Without citation, your choice of hyperbole appears to be bias. Further you state, "For every case that gets unsealed, there are hundreds, if not thousands of cases sealed in documents that are never opened because their public relevance goes unchallenged.." I will give you the benefit of the doubt and assume you meant this sentence to communicate conjecture on your part, however, I suspect most of your readers will assume it is a verifiable truth statement. A journalist or their editor would have recognized that this statement (actually accusation) is unsubstantiated conjecture. Without citation of a documented study, It would have been accurate to state "there may be hundreds..." or to state, "given the number of wells already drilled and the current rate of leaks, it is easy to estimate there may be hundreds...". I read your blogs and I like your work - it is always well written and generally accurate, but you work in the realm of advocacy journalism - I just hope your readers understand this. Thanks for your comment. I’m an advocate for free speech and open government. Like many in the working press, I tend to look at concentrations of wealth and power with skepticism – a watchdog function -- and I see the press as an agent of reform. This is a liberal tradition with the press since the days of Joseph Pulitzer. I’ve spelled out my position many times on this blog, I begin my talks with it, and you can find it for the record here. There are many instances of the industry claiming that fracking fluids are harmless. As one example, see testimony of Brad Gill of the Independent Oil & Gas Association of New York to the New York State Assembly Committee on Environmental Conservation Oct. 15, 2009 in which he characterizes fracking fluid as “small amount of dilute, benign additives” like “Canola Oil” and “those found in personal care products.” Generalities that I make on SGR – in the interest of sticking to a 500 to 1,500 word format per post -- are generally supported by research in my book, Under the Surface, which has a section of footnotes that details sources and citations. I cite links to sources often when they are available on line. Again, thanks for reading and for checking in on this important point of transparency, both with my reporting and the raw material I work with. Thanks for your civil and measured response. I get your point, Brad Gill's comments look like an understatement of the risks (I have not read his full testimony), but I think my point still stands that it is not the industry's position that "fracking fluid is harmless". I have read and heard many industry engineers and executives discuss the risks associated with fracking fluids. Democracy depends on free press, an educated public, and most of all, people listening to each other - thank you for listening and best of luck with your work. Great deal of patience I must say.You might be having many sleepless nights to quote down such 'out of box' post.This blog seems to be written focusing on PR agencies I guess. PR Agencies offers the most powerful public relations campaigns. Expert Public relations & media buying solutions brings out a permanent solution to your PR issues. BlueHost is ultimately the best website hosting provider for any hosting services you might need.